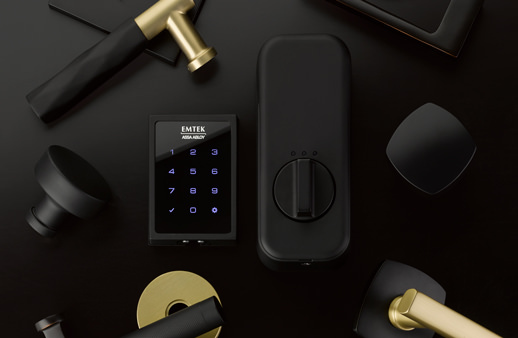 What's New: Door & Cabinet Hardware Trends | Emtek Products, Inc.
EMPowered™ is a design-focused electronic lock solution that can integrate with the latest in smart home technology. Introducing Emtek's new Industrial Modern Cabinet Hardware Collection! Edgy and transitional, this collection is inspired by industrial brackets and fittings, but versatile enough for everything from farmhouse to traditional-style interiors. Browse our Product Selector for new items. Emtek is pleased to announce the addition of 5 new sizes for the Freestone and Mod Hex designs. Included in the expansion are 3 new pull sizes, as well as 2 new extended pull options. These extended pulls are ideal for upgrading pre-drilled cabinets in a remodel, to create a sophisticated look with a longer, modern hardware design. Emtek's new Modern Rectangular Flush Pull for 8" Center-to-Center Door Pull is now available! Designed to pair with any 8" door pull from Emtek, this new flush pull is the perfect low profile, thru-mount solution for barn or sliding door applications. 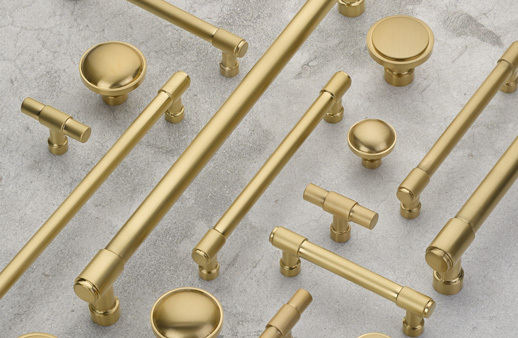 Constructed from brass and available in 10 finishes, the clean aesthetic fits well with a variety of design styles. 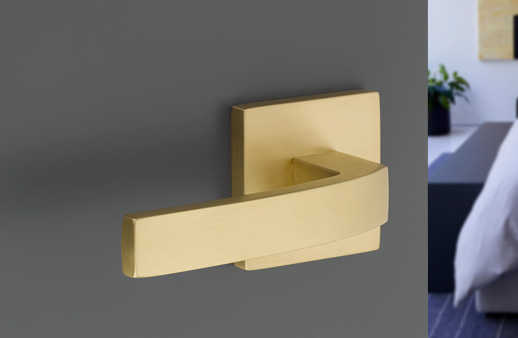 Click here to learn more about Modern Rectangular Flush Pull for 8" Door Pulls. Emtek is please to welcome the new Mariposa and Bryce Levers! Reminiscent of the Bauhaus-inspired Stuttgart and Hercules levers currently offered in brass, Mariposa and Bryce can be paired with any of the five available rosettes, in any mix of our three Sandcast Bronze living finishes for a modern, yet patinaed look. Click here to learn more about Bronze Rustic Modern Bryce and Mariposa Levers. Introducing Emtek's new Modern Rectangular Cabinet Hardware Collection! This quadratic collection showcases a boldly modern aesthetic, with a beveled underside detail that highlights and provides a comfortable hand-feel. Click here to learn more about Modern Rectangular Cabinet Hardware. 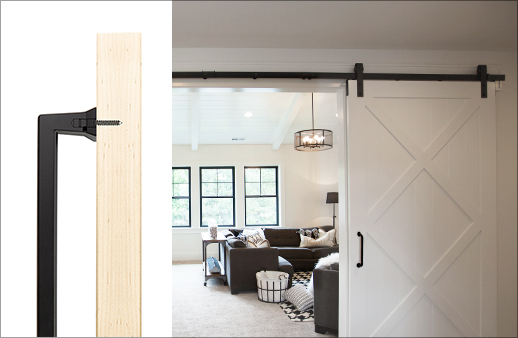 Add architectural interest to your interiors with Emtek’s new Flat Track Sliding Barn Door Hardware system! Available in Stainless Steel and Flat Black Steel, the new Barn Door Hardware track is rated for a maximum weight of 400lbs and can also be fitted with an additional hanger kit to be utilized in double door applications. Click here to learn more about Emtek's Barn Door Hardware. 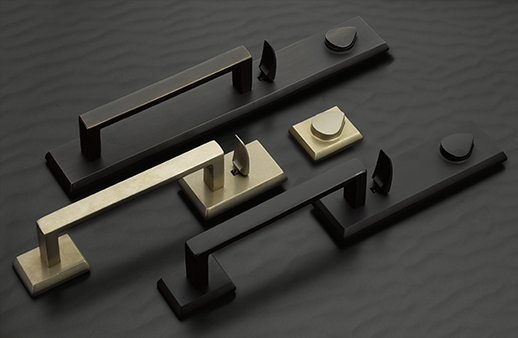 Emtek's new Sandcast Bronze Rustic Modern Cabinet Hardware Collection is now available! A contemporary design in a rustic material, this solid bronze collection would be as perfect a fit in a city apartment or a mountain retreat. The Rustic Modern Collection includes 5 new cabinet hardware pieces in a range of sizes, all available in Emtek’s 3 Bronze finishes. Click here to learn more about Bronze Rustic Modern Cabinet Hardware. The new EMTEK SELECT Lever program offers a new level of customization: choose your textured lever grip, stem design, and pair with any of our available rosettes options (in any mix of finishes) for thousands of unique combinations-- made just for your project. Click here to learn more about EMTEK SELECT Levers. Introducing the Emtek Large Multi Point Entry Set Trim, designed to match traditional Entry Set Lock dimensions. Trim plates are available in three distinct designs and can be combined with our wide variety of lever and finish options for a custom look. Click here to learn more about Large Multi Point Entry Set Trims. Introducing Emtek's new Sandcast Bronze Rustic Modern Rectangular Door Hardware. 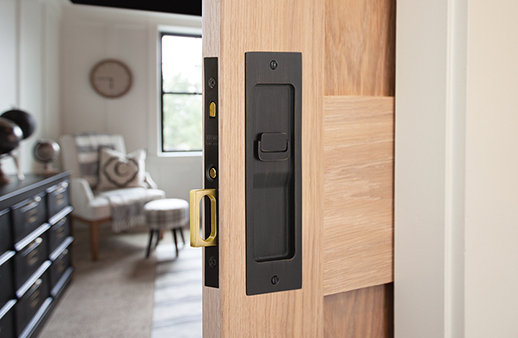 Joining recent additions to the Rustic Modern Collection, the new Rectangular Entry sets offer three new entry plate styles, a new deadbolt, a new door pull and a new grip style. Click here to learn more about Bronze Rustic Modern Rectangular Door Hardware. Emtek’s new Myles lever is now available! With a modern T-Bar stem and round profile handle, this versatile design is the ideal lever choice for modern and industrial style interiors. Crafted from solid brass, Myles can be customized with any Emtek rosette and is available in our seven modern finishes. Click here to learn more about the Myles lever. Appliance pulls have now been added to Emtek's Urban Modern Cabinet Hardware Collection. The Freestone and Mod Hex designs are available in 12" and 18" center-to-center pulls. With optional Concealed Fastener or Back-to-Back mounting, they are just as much at home as a door pull as they are on a paneled kitchen appliance. Click here to learn more about Freestone and Mod Hex appliance pulls. Emtek’s popular Modern Rectangular Pocket Door Mortise Collection is now available in Sandcast Bronze. Available in keyed, passage, privacy or dummy functions and in all 3 of our Sandcast Bronze finishes. An ode to the materials of the past and design of the future, Emtek's Sandcast Bronze Rustic Modern Flush Pulls are now available! This new Flush Pull Collection can be used in a variety of sliding door applications, and come in 4 sizes and all 3 of Emtek's Bronze finishes. Click here to see more Flush Pulls. This new Multi Point option is for American cylinder hubs above handles and 5-1/4” center to center spacing, and is available in all Stainless Steel, Sandcast Bronze, and Lost Wax plate styles and handles. Click here to learn more about Door Configuration #8. The new Concealed Surface Mount option for door pulls joins the standard thru-bore and back-to-back applications, and is available for all 8” door pulls, and all 12” and 18” appliance pulls. Click here to to see Door Pulls available with this mounting option. 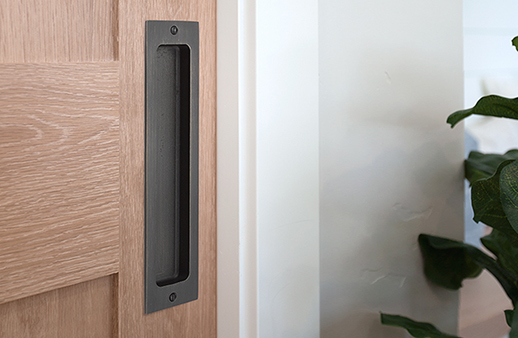 The Spencer door lever features a comfortable, modern flat-fronted grip and a rounded base. It is available in our modern finishes that can be paired with any brass rosette. Click here to learn more about the Spencer Lever. 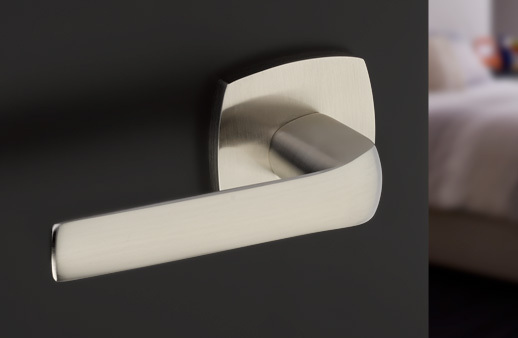 The Aston door lever features a modern industrial profile with unique stepped detailing where the grip meets its cylindrical base. It is available in any of Emtek's modern finishes, and can be mixed and matched with any rosette. Click here to learn more about the Aston Lever. The Dumont lever draws inspiration from ultra-modern, European architecture. It showcases a square stem that meets its rectangular handle at a 90 degree angle. 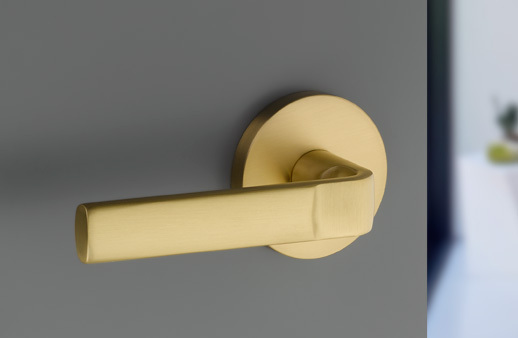 The Dumont lever is available in a range of modern finishes that can be paired with any brass rosette. Click here to learn more about the Dumont lever. 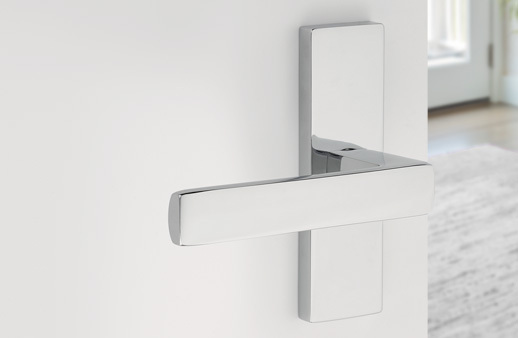 The new contemporary Breslin lever from Emtek features a gentle, sweeping grip and a square base. Available with any brass rosette style, the Breslin comes in Satin Brass (US4), Oil Rubbed Bronze (US10B), Polished Nickel- Lifetime (US14), Satin Nickel (US15), Flat Black (US19), Polished Chrome (US26), or with an upcharge in Unlacquered Brass (US3NL). Click here to learn more about the Breslin lever. 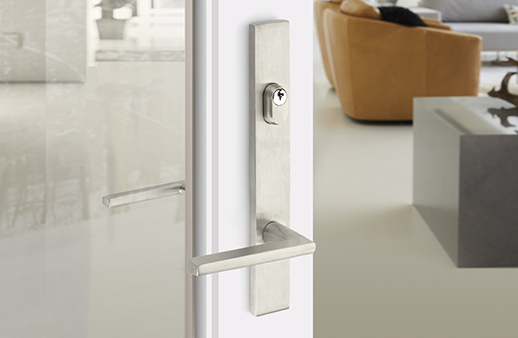 Following the popularity of the Urban Modern cabinet hardware collection, we are pleased to announce the launch of Emtek’s new Urban Modern door hardware. These new designs offer a contemporary, soft-square and convex profile. 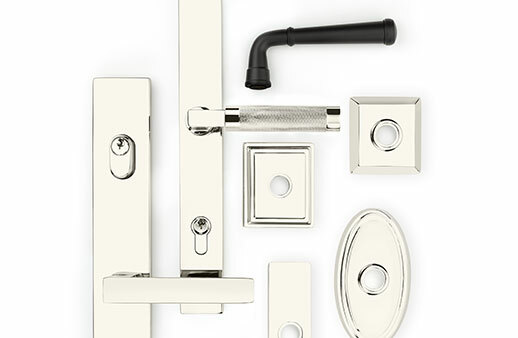 Click here to learn more about Urban Modern Hardware Collection. The Transitional Heritage cabinet hardware collection now includes Blythe and Westwood 12” and 18” center-to-center appliance pulls. This newly expanded collection blends traditional details with modern sophistication to create an art deco-inspired look. Click here to learn more about Blythe and Westwood appliance pulls. Easily achieve a modern, minimalist aesthetic with the restrained profile and comfortable grip of Emtek’s new Cabinet Edge Pulls. A unique soft square design, our new Cabinet Edge Pulls come in seven different lengths and are available in our modern finishes. Click here to learn more about Cabinet Edge Pulls. Click here to learn more about Cabinet Latches. The Transitional Bath Hardware Collection offers a sophisticated yet seamless design, with subtle detailing on each stem and accompanying rosette. Forged from brass and available in seven finishes, the collection includes a towel bar in four sizes, a square towel ring, a bar style paper holder, and a single hook with rosette. 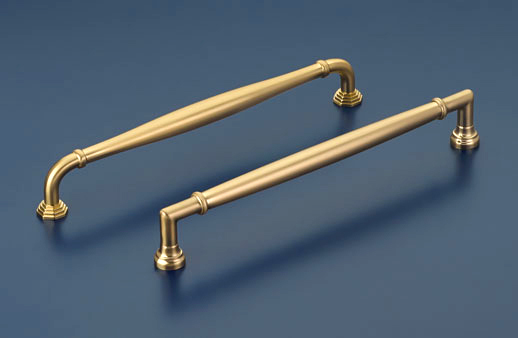 Click here to learn more about Transitional Brass Bath Hardware. Click each link to learn more about Modern Rectangular Flush Pulls in 4", 6", 7" and 10". Create the ultimate contemporary aesthetic with Emtek's new Adelaide and Brisbane Narrow Mortise locks. The entry plates feature a slender width of only 1 ¾" and are available in full-length, monolithic, lever by lever, and knob by knob configurations. Both the Adelaide and Brisbane mortise lock designs can be ordered as F13 or F20 functions, with finish options including Satin Brass, Oil Rubbed Bronze, Satin Nickel, Flat Black, Polished Chrome and Unlacquered Brass. Click here to learn more about Adelaide and Brisbane Narrow Mortise Locks. The new Brisbane 8" Door Pull is now available in standard and back to back applications. 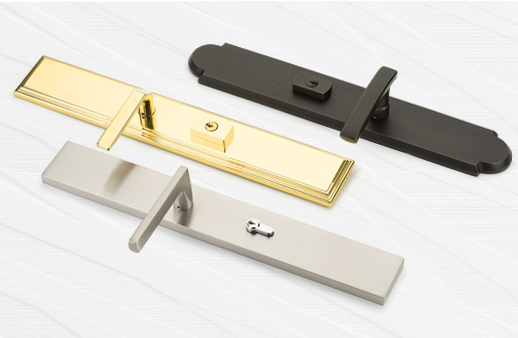 Offered in Satin Brass, Oil Rubbed Bronze, Satin Nickel, Flat Black, Polished Chrome, and Unlacquered Brass, the Brisbane Door Pull can be used separately or with pull plates. Click here to learn more about Brisbane Door Pull. Introducing Emtek’s new Square Flush Pull, a modern option for sliding doors. This stylish pull measures 2 ½” x 2 ½” and fits a standard 2⅛” diameter door prep. The Square Flush Pull is made of solid brass and available in all of Emtek’s Brass and Bronze Patina finishes. As with all of Emtek’s products, you have the freedom to coordinate finishes to match your home design or color scheme. Click here to learn more about Square Flush Pull. 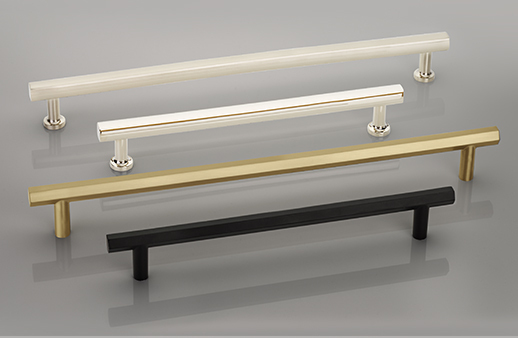 Introducing the new 12" towel bar for Emtek's bath hardware collections. The new towel bar size joins the existing 18", 24", and 30" options. Available in Modern Brass, Traditonal Brass, Sandcast Bronze, Tuscany Bronze, Stainless Steel and Wrought Steel styles. 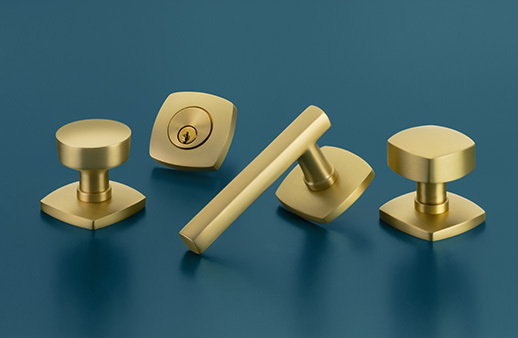 Three of Emtek's most popular cabinet hardware styles are now available in new size options. Introducing the new Transitional Heritage cabinet hardware collection. The collection offers traditional foundations with clean, sophisticated features to create an art deco-inspired look. 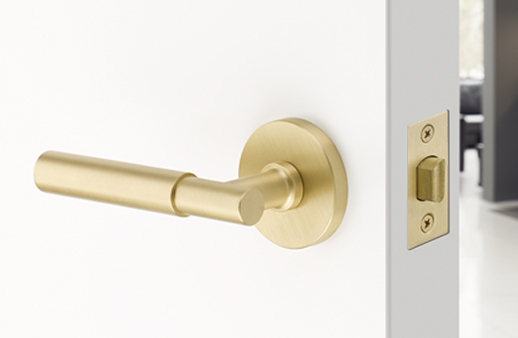 Timeless and luxurious, each knob and pull is offered in a range of sizes and finishes.